Our service providers include Royal Mail, DHL, UPS, UK Mail and other premium carrier services. Economy services are not tracked and are predominantly Royal Mail Second class dependent on weight . Standard services are not tracked and are predominantly Royal Mail First Class dependent on weight. Express services will require a signature and are fully tracked, a tracking code will be provided on confirmation of your orders dispatch. They are predominantly Royal Mail Special Delivery or DHL, dependent on weight. 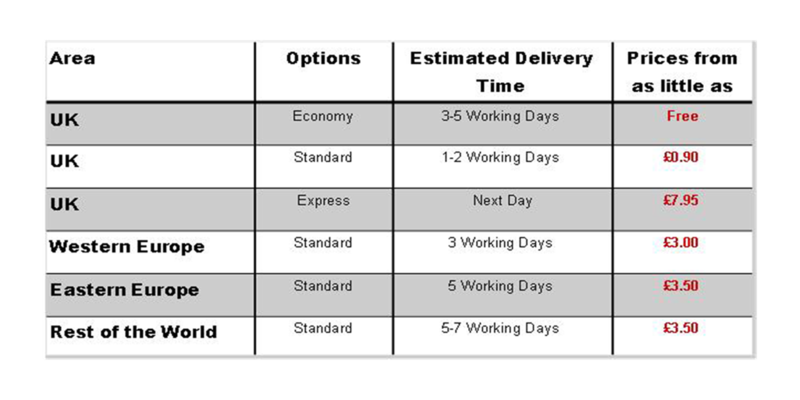 Express services are usually next day delivery but can take longer to certain UK postcodes mainly highlands and islands. Please see Royalmail.com for more information. International Standard Delivery is based on Royal Mail Airmail, maximum weight is 2kg. If your prospective order shows £500.00 for delivery, then it is over the maximum weight of 2kg. Please contact us before ordering and we will get a dedicated price for you using an appropriate parcel service. 1. Standard off of the shelf product. We aim to dispatch standard off of the shelf items within one working day. Personalized printed products are dispatched within one working day from receipt of an approved proof (we will not print until we have approval from you that you have checked and agreed that it is ok to print). All embroidered products are made to order and take up to 5 working days to be dispatched. Your total delivery time from receipt of order is the estimated dispatch time plus estimated delivery time, so for an order for plain place cards economy delivery would be 1 day dispatch + 3-5 day delivery time (based on working days). If you are in a particular hurry for something then please contact us first to get an estimated dispatch time before ordering.